When we adopted Cooper from the shelter they gave us an approximate date of birth. Today is approximately his second birthday, so we had a little fun. Yes he is wearing a party hat! He's such a good boy! Here's what I wore today - the last item from my Asos sale haul. Bracelets: the usual plus Hermes kelly double tour and red crystal bracelet made by a friend. Bag: Balenciaga Coquelicot 2011 RH Velo from Reebonz. Wearing the velo strap doubled up - video how to is here. I had this dress in my cart for a while but finally decided to get it after seeing a similar dress on Teodora from Teodora's Lookbook. The great Asos sale price helped too! It was a great thing to wear as it was a hot day and I had to run a meeting unexpectedly so it worked well for that too. Dresses are so easy for work! Do you find dresses good for work? Hope everyone had a good Thursday! 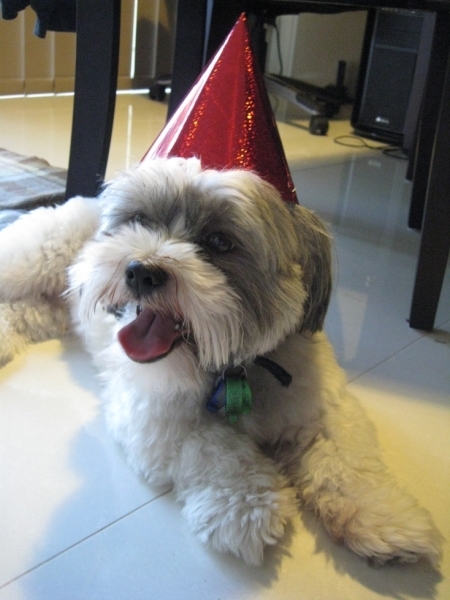 Aw, Happy Birthday Cooper! :) How cute. Happy birthday for Cooper from Spain too!!! And thanks for your lovely comment dear! Are you sure that you're follow me by GFC? Because you don't appear on my GFC Followers list...Check it please! Then, I’ll follow you!!! Thanks! I have been having some delays with Gfc not showing me recent posts but I'm sure I am following you :) maybe just a glitch! Mica, thank you for mentioning me. It is a great compliment. And Happy Birthday to Cooper. He looks like he is fun to be around. I love how you styled the dress with a bright skinny belt. It is next to do on my styling to do list. Cute dog! Happy birthday to Cooper! hehe. You know that I love your bag, right? And i think the bag is nearly as lovable as Cooper! It is a good bag :) will of course be checking out your new post! aww such a cute dog! He is! And I didn't notice the hat matched before, should have invited him into my outfit pic! Thank you! I would definitely read a blog about dogs, they are so cute! Your pup is adorable and I love your dress! Thanks so much :) I tend to wear red and black a lot! Loving that purse! And loving your blog. 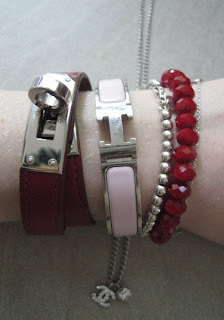 and i love that read knuckle bracelet...bal or hermes?? Yep, 14 in doggy years! awww happy bday cooper! omg i love your bracelets! Such a great post, I like it!!! The photos are simply fab! Happy Birthday Cooper!!! That's so cute! And love the simple black and red!